With the impending elections next month, a lot of energy is going into increasing voter turnout for local body elections. There is one major campaign aimed at increasing voter engagement by the Electoral Commission and LGNZ. TINZ has joined with others to host candidate events. I can hear in my mind's ear widespread yawns in response to this opening line. Not the “ho him crasher” first line my father told me is the way to engage an audience! TINZ has initiated what it hopes is a new tradition of three yearly events to hear what candidates have to say about preventing corruption, ensuring transparency and accountability, building integrity and harvesting the benefits this good reputation entails through local council and regional development. This time around, TINZ managed to generate audience engagement in Wellington, Palmerston North, the Manawatu District and Auckland with groups in several other cities indicating interest. Mayoral candidates ‎at TINZ’s events have provided a refreshing range of interpretations about topics focussed on what this means for local government and their communities. While some candidates would get a high score for preparing their homework on the topic of corruption, the general understanding of why preventing corruption matters for local government is below average. Understanding how New Zealand’s reputation and brand is enhanced by local government democracy would receive an even lower score. There is a slight glimmer of knowledge that talented people are more likely to want to live here if their local government is regarded as interested in ideas such as the legitimacy of government and the quality of service provision supported by transparent procurement. A surprising occurrence, however, has been the way that the word “transparency” has entered the lexicon. Candidates of every ideological school are committed to transparency, open data and open democracy. This message and the experience with its recent mayoral candidate’s events has encouraged TINZ to plan ahead for next year when there will be opportunities to bring together the elected Mayors and central government parliamentarians running for seats in their regions. This year’s candidate events have shown that the candidates are familiar with accountability and even transparency. Next year provides an opportunity to test what these mean in practice when there are intersects between central government initiatives and local interests. This month as the Chair has noted, TINZ has been focussed on Local Government Elections. Brexit anyone?! The sad fact is that here at home, as around the world, more and more people are becoming disengaged with politics and disenfranchised from the political process. TINZ decided to engage local Mayoral Candidates in public panels focussed on issues of transparency, corruption prevention and integrity as a small step in engaging citizens in the political process. To date we have partnered with local universities to hold events in Wellington, Auckland and Palmerston North. We are still working to squeeze in one or two more events before the election. Our plan is to hold a series of similar events prior to next year's national elections. Findings in Transparency International New Zealand's Integrity Plus 2013 New Zealand National Integrity System Assessment (NIS) drive our interest in local government transparency, integrity and accountability. In New Zealand the absence of constitutional protection for the powers of local government is also stressed as a critical weakness. While, arguably, local government has a considerable degree of independence, there are no entrenched constitutional provisions to protect that independence. By international standards, local government in New Zealand has a narrow range of functions accounting for a smaller than normal percentage of public spending. improving information transparency and public accountability. Strengthening local government integrity systems helps make the case for greater devolution and returns power to our local communities, thereby reinvigorating participatory democracy in New Zealand. TINZ will be working with our new Mayors and their Councils post-election to achieve this. As part of the 2016 Local Government Elections TINZ hosted a series of mayoral candidate discussions. These discussions provided the candidates with the opportunity to discuss subjects including managing diversity, preventing corruption and progressing economic development strategies to harvest the benefits of New Zealand's international reputation for integrity. On August 18, around 150 Wellington TINZ members and friends gathered to listen to six of their eight mayoral candidates' individual visions for creating and maintaining transparent, accountable and corruption-free government in New Zealand. The candidates had all been sent emails listing the three topics focussed on corruption and transparency. Master of Ceremonies, Bryce Edwards, reminded the candidates of the questions in his introduction. What are your recommendations to improve management of Wellington’s increasingly diverse populations with a growing number of new immigrants coming here from corrupt countries? What steps are required to be taken by the Council to better prevent corruption? As the Cultural Capital and the homes of the 4th most trusted public sector in the world, what is your vision of the ways that the Wellington City Council can more effectively harvest the benefits of New Zealand’s reputation for integrity and attract quality jobs? Candidates said afterwards it was the most interesting event they had so far attended and they appreciated the stretch that the questions provided them. Jo Coughlan generously attended the event even though she had another function to go to. She hadn’t appreciated that the focus of the event was solely on transparency and mainly talked about ensuring there was direct traffic routes in the city. In terms of question three, harvesting the benefits of New Zealand’s reputation, she described how Wellington’s transparency and reputation for integrity attracts good business to the capital. Andy Foster focussed on the importance of local democracy and getting the voters out. He noted that roughly 40% of voters would post in a ballot, twice as many as the 20% of Wellington who use public transport. He saw value in Wellington engaging other cities to share knowledge about reducing corruption and building economic development through a good city brand and reputation. Nick Leggett talked about accountability and transparency where data is king. He fully addressed the question of new residents by describing immigration at attracting migrants who want to come to New Zealand to get away from corruption. In terms of council transparency, Nick wants to open the books – to share everything, noting that sunlight is the best disinfectant. In terms of leadership, Wellington should own being the capital city. Nicola Young and Nick were two candidates who said on the evening that they could work together. Nicola sees the opportunity for Wellington to be an education hub with transparency enabling it to promote the quickness of driving forward innovation. She noted the importance of reputation to the city, with Council needing to be sure that Wellington was above reproach in regards to integrity. Its diversity is a strength – important to nurture what we have. Current Deputy Mayor, Justin Lester was the best researched on the transparency questions on the evening. He said that the Council and city “need to have a high moral code. Wellington city is transparent, having high standards of reporting, demonstrated by its strong Standard and Poor’s rating. Helene Ritchie had also taken time to prepare answers to the questions. She said that she was “ready to lead a corruption free city in a corruption-free country.” Helene noted that “it is features like this that attracted innovative, creative people to come, stay and live in Wellington. Candidates Dr Keith Johnson and Johnny Overton failed to show up to the Wellington Candidate event. On August 31, around 50 Palmerston North City and Manawatu District residents gathered to listen to their mayoral candidates' individual visions for creating and maintaining transparent, accountable and corruption-free government in New Zealand. Two mayoral candidates are standing for each Council, including both of the incumbents. Grant Smith, the incumbent for Palmerston North, linked his support for the four Open Government principles with implementation strategies currently in place for these. Strategies which he noted included the presence of the Local Government Official Information and Meetings Act request process to enhance accountability, and the presence of a transparency section on the City's website, which includes mayoral diaries and expenses and a gift register. He holds weekly 'Meet the Mayor' sessions, and says there is a “Digital Enablement Plan” to engage citizens further. His challenger Ross Barber aimed to defame Smith for the fact that his previous mayoral campaign was in part funded by the Higgins family. His emotional speech concentrated on the perilous state of politics and the untrustworthy and possibly insane nature of politicians generally. The Manawatu mayoral contest, as presented by the incumbent Margaret Kouvelis and her challenger Helen Worboys, yielded a fruitful discussion. Kouvelis focussed on the need for greater democratic participation and public accountability in New Zealand, citing her recent implementation of an independent Audit Committee for the Manawatu District Council and the importance of their gift register. She noted how easy it can be for white-collar crime to go unchecked in New Zealand; New Zealanders may find the concept of cash bribes abhorrent, but some might not be averse to “supporting their mates” in a context which should be treated as a conflict of interest. Worboys focussed on the benefits of reducing corruption for communities, noting the greater public trust coming from open communication leading to people feeling more valued. She spoke to her general vision of council doing more to be transparent and accessible to the public, noting that corruption may find its way into New Zealand in part due to the rise in globalisation. Both candidates agreed that council meetings should be open to the public, but that there was also an important role to be played by the closed workshop settings, where council members were encouraged to explore a range of viewpoints on an issue and could do so without the fear of media misinterpreting this forum. TINZ was generously included by the University of Auckland’s Faculty of Creative Arts and Industries to co-host their event for Auckland Mayoral Candidates on 7 September. Candidate, Mark Thomas said that the solution was to “avoid prescriptive, rules based approach” to leadership and policy. He recommended the use of planning tools, better roads and better “control” of the Council’s budget. Mark wanted greater transparency in planning as he saw it as important to connecting people and organisations to collaborate around design-led solutions. Leading candidate, Parliamentarian Phil Goff, was more visionary, wanting to “build a city for the future, moving up and out and planning for immigration.” Phil wants more transparency around the collection and expenditure of the petrol tax, looking to pay for roading with central government-collected revenue from activities carried out in the Auckland region. David Hay said that Auckland’s top priority is to house the homeless. His interest in transparency was over community decision-making, seeking to re-organise the Auckland Council to provide more power to community Boards where residents would be more engaged in the design of the city. He saw the STV approach to voting as engaging people more in local body decision-making. Penny Bright described herself as the Bernie Sanders of the candidates, stating that “Auckland needs to come back to Aucklanders.” Of all the candidates across New Zealand, Penny has the most detailed corruption-fighting platform. Amongst her specific concerns are that so many council decisions are behind closed doors or made by appointed rather than elected people. John Palino asked the audience to “visualise the satellite city.” His views are contained in a book, Vision for Auckland. When asked about ways of preventing corruption, he stated that “transparency is extremely important” and, referring to the tendering of Council projects he asked for greater transparency around the procurement (“bidding”) process. Palino also views the ratepayer as being better served if there was an independent budget office and a public citizen “report card” of Auckland financial performance. Speaking of transparency, Victoria would “open the books” to the rate payer. Now if only Gen0 will make the effort to vote!! While it is our responsibility, as citizens, to hold our local councillors to account, it is first and foremost the job of the Councillors, especially the Mayors, to tangibly demonstrate to us that they are always seeking to maintain and improve levels of transparency, and to educate the wider public on the LGOIMA (Local Government Official Information & Meetings Act) mechanisms for holding their local government accountable. All candidates seemed appreciative of this and it is positive that both incumbents commented on specific steps they had taken with this framework in mind. It is to be hoped that both 2016-19 Mayors will build on this legacy. New Zealand may have low levels of corruption comparative to other countries, but as session moderator Nicky Hager argued, any complacency will allow corruption to creep in to Local Government. We expect all New Zealand mayors to encourage a culture of openness and proactive publication of data not only in their mayoral office but throughout all of the local governors and governing bodies guided by their vision and example. Have your say on how our country should tackle money laundering and counter the financing of terrorism as part of Phase 2 of the AML/CFT Regime. The Ministry of Justice is seeking your views to help determine some of the detailsof the extended AML/CFT regime, so that we can enhance New Zealand’s efforts to detect and deter criminal activity while minimising the impact on businesses. Click here for more information. The deadline for submissions is 16th September. At the invitation of the Ministry of Justice, Transparency International New Zealand Inc. (TINZ) has reflected on and documented its thoughts on Phase 2 of the AML/CFT Act. TINZ strongly advises that there be an extension of the Act to address high risk sectors of industry and society, as proposed in the Consultation Paper prepared by the Ministry. TINZ also supports a “risk based approach”, to paraphrase the Paper, ensuring that “efforts are proportionate to the risks”. The approach to managing corruption and crime in New Zealand must focus on taking preventative steps. Through education and transparency, the inherent respect for integrity by the public of New Zealand, whether as business owners, professionals, employers, employees, consumers or citizens, will be a powerful preventative force. It is clear to TINZ that the different business sectors covered by the AML Phase 2 extension are valid and an integral and supportive part of New Zealand business and society. It is important that AML Phase 2 encompasses as many financial institutions and individuals that deal in money as it can. Evidence of money laundering in New Zealand via high-value goods as set out in the consultation paper demonstrates why these sectors require coverage. A particular area for focus here is residential property and high value vehicles – cars and motorcycles. A feature of our banks is that they have been developing systems to combat money laundering for some years. This has forced criminals to develop more cunning ways of hiding ill-begotten gains including the purchase of cars and houses. Amongst its recommendations is on-line Corruption Prevention Training aimed at identifying and preventing corruption, backed up by channels for proper identification documentation being passed on to the appropriate authorities. The AML Phase 2 is extended to fully cover all professionals (including lawyers, accountants, real estate and conveyancing) and those involved in trading high value goods, in gambling and who are engaged in setting up and managing New Zealand any form of high value transaction, be it in the form of legal tender or goods and services. This also includes coverage any of these goods at the point of entry into New Zealand. TINZ recommends that the widest scope of coverage should be made to detect illegal funds at the placement stage of the money laundering cycle. That there be regular assessments and reports about the integrity of the financial system based on the proposed TINZ 2017 New Zealand Financial Integrity System Assessment (FISA), which already has wide conceptual support from the finance sector. This would cover government and industry financial activities, roles, responsibilities and activities. In doing so, a wider understanding of the current state of various aspects referred to in the Consultation Paper can be assessed, including the quality of Information sharing and the quality of supervision at both national and industry levels. Ensure that “Know Your Customer” procedures are compliant for all sectors covering all service providers, based on best practice that is regularly reviewed as knowledge is gained about the nature of laundering activity and financial crime. Increase coverage to in-house professionals employed within large organisations and ensure their national associations provide professional development to sole traders. Ensure the registry of beneficial ownership and identified settlors covers all relevant New Zealand enterprise structures (trusts, companies, co-ops, charities) to enable review and audit by law enforcement and compliance bodies. Additional effectiveness will be achieved if this is consistent with international initiatives. Revise the current list of entities subject to simplified due diligence based on an updated risk assessment of these types of entities. Develop an on-line training tool (Corruption-Prevention Training) that includes guidance about money laundering and can be used by existing and new residents to support New Zealand’s reputation for strong integrity systems. Include provisions to report suspicious transactions that are occurring outside New Zealand but involve New Zealand entities and persons as illegal activity which enriches persons in this way is hard to detect and if an instrument is put in place, it could pick up this illegal activity. Example could be a NZ Trust or company holding funds in overseas bank accounts which can be operated through emails to transfer funds. Expansion of the Act on information sharing to allow departments such as Inland revenue to interrogate the database held by the FIU which contains suspicious transaction reports to allow early detection of money laundering activity. This also has the advantage of widening the number of law enforcement investigators who are working in this field. In summary, TINZ regards the improved clarity achieved through well considered legal standards, guidance, professional development and training about money laundering will improve AML Phase 2 application and compliance, while avoiding the perverse risk avoidance and non-acceptance of normal economic transactions. This will address the unintended consequence of burdening smaller and medium sized operators in favour of the larger economic actors. These larger, often global organisations, are where the material financial portion of irregularities are evidently perpetrated. TINZ has provided further evidence in support of the above recommendations in its full submission. Transparency’s New Zealand Chapter, TINZ, has frequently commented on our strong positive rating in Transparency International’s World Corruption Perceptions Index (TI-CPI). This is a key factor behind the reputation for integrity that our public, private and non-profit organisations enjoy, contributing to New Zealand’s trade and business success. Latest figures show an alarming change in the direction of travel. Not only has our rank on the TI-CPI fallen from 1st to 4th between 2013 and 2015, but now the latest figures out for transparency in the Real Estate Industry show a fall from 4th place 2 years ago to 6th place now. Proven transparency and integrity in markets around the world are now seen as very important, and Transparency International is not the only organisation to study and report on it. This reflects the now widely-held belief that these principles are critical to business, peoples, and governments in order to create stability, trust, and faith in the systems we all need to use every day to do business and live our lives. The areas of the world where daily life can’t be lived and business performed without costly, humiliating and dangerous unethical practices are those in the lower or ‘red’ corruption-integrity rated countries. Let’s not go there! So it is interesting to have a brief look at other Transparency Indices to see how New Zealand fares by comparison. With the recent focus on homelessness, housing affordability and the existence of previously unseen levels of speculation in the housing market, the Real Estate market’s importance in the New Zealand economy has never been higher with fierce current focus on its ups and downs. The 2016 JLL Real Estate International Transparency Index report was recently announced. The JLL Index looks at 109 countries and markets by their data availability, governance, transaction processes, property rights, and their legal and regulatory environments – all from the point of view of transparency, good governance and public good. This index is updated every two years and has charted real estate transparency internationally for 17 years. JLL noted that institutions, governments and businesses are now demanding greater integrity and clarity, and the general public are seeking the same assurances. Top in this index is the United Kingdom, Australia is second, then Canada, USA and France. New Zealand is sixth, followed by The Netherlands, Ireland, Germany and Finland making up the top ten. TINZ’s observations on the New Zealand Real Estate market stem from the hothouse climate which the overheated house market here has generated. This brings the possibility that funds can be brought into New Zealand and delivered in a suitcase to buy a house, evading normal banking channels and regulatory scrutiny, raising the same serious issues which have now led to legal change to trusts. These concerns will be addressed by the implementation of Phase 2 of the Anti-Money Laundering Bill. Another concern is the negative economic and social impacts of ‘land-banking’ which is a growing practice in current conditions. New Zealand’s international real estate transparency ranking is still fairly high, but our slide from fourth to sixth is a concern – exactly the same situation as with Transparency International’s wider corruption index. For exactly the same critical reasons we should be improving, not slipping – the effort to make that improvement is worth it. For a country which has consistently held top position, any slip is notable and negative – would fans be happy if the All Blacks’ world rugby standing similarly slipped to fourth? Given the importance of reputation to business success, this is more than a matter of pride, it is also a matter of dollars and cents. Increasing evidence shows that reputation contributes to a greater proportion of company returns than any other factor. The outrageousness of this case, where true life is worse than drama, should not blind us to the serious risks in looking for a business win-win which fails the integrity test. The fact that no money apparently changed hands is immaterial. Could it happen here? Possibly not, but let’s check our commitment to company anti-corruption and integrity policies, processes, training and audits. Real integrity is worth it. Transparency International recently released a recap of the May 2016 London anti-corruption summit. 43 countries, 600 commitments: Was the London Anti-Corruption Summit a success? Overall Transparency International judged the Summit a success in promoting new and ambitious anti-corruption pledges on a comprehensive set of key issues in a wide range of countries. But the real verdict will only come when governments follow through and adopt the reforms that prevent corruption and prosecute corruption when it occurs. TI’s media release is at 43 countries, 600 commitments: Was the London Anti-Corruption Summit a success? and the full report is here: Was it worth it? Assessing Government Promises at the 2016 Anti-Corruption Summit. The main Summit documents are available at Anti-Corruption Summit: London 2016.
International Sport Integrity Partnership: New Zealand will work with international sports bodies to develop a partnership for combating corruption in sport. Transparency and Integrity: New Zealand will continue and intensify efforts to develop procurement capability, including initiatives that safeguard integrity in the procurement process. Debarment Database: New Zealand will explore establishing an accessible and central database of companies with final convictions for bribery and corruption offences, and ways of sharing information on corrupt bidders across borders. UNCAC Implementation: New Zealand commits to working together to support efforts to implement United Nations Convention Against Corruption including the voluntary provisions. Denial of Entry: New Zealand will also, where appropriate under New Zealand law, deny entry to specific individuals who are identified as being involved in grand scale corruption. Public Register of Beneficial Owners: New Zealand commits to exploring the establishment a public central register of company beneficial ownership information. Access to International Law Enforcement: New Zealand will also continue to implement bilateral arrangements that will ensure law enforcement in one partner country has full and effective access to the beneficial ownership information of companies incorporated in the other partner country. Financial Action Task Force: New Zealand will also explore how to appropriately incorporate the FATF standards on preventing money laundering in the non-financial professional services sector into domestic legislation. The infographic on the right displays the assessment of New Zealand's commitments. Over the nearly 7 years since Lyn Provost has been Auditor General, she has taken time to analyse what has been learned. This is based on responsibilities of publicly reporting on the audits of about 3,700 public entities and preparing 20-30 in-depth reports on specific matters. Her annual publication, Reflections from our audits: Governance and accountability is an opportunity to publish her views. She also speaks about them, including a recent presentation of the Wellington Branch of the Institute of Directors. Two areas she particularly mentioned are the role definitions of governance and management, and improvement in risk management. Then in her Reflections, the Auditor General lists and elements of what needs to be done better. Have clear roles and responsibilities that separate governance and management there she wondered if the recent increase in the liability of governors (Directors) had the unintended consequence of driving them deeper into management and operational matters. The Auditor General also raised the topic of better quality management of public sector procurement. Lead by setting a constructive tone from the top that shapes culture to ‘do the right thing’. Involve the right people where the level of trust between people affects the effectiveness of the governance arrangements. This comes down to the Board appointment process and ensuring that it is set up to appoint new directors with the particular skills required. Invest in relationships built on trust and respect, for example, Crown Controlled Organisations’ success depends on the effective relationship that they have with their local body ratepayers. Be clear about accountabilities and transparent about performance against them. An example is the finding from examining three Christchurch rebuild projects that all would benefit from producing clearer accountability frameworks. This includes using social and traditional media to keep people up to date with the project’s progress. An area that TINZ would like to see more formally developed in public sector risk management is the inclusion of specific corruption prevention risk management processes. Over the years, as government agencies have learned about fraud, cases have been identified and prosecuted. Similar oversight of corruption may find there are more instances than we would like to believe and building knowledge useful for corruption prevention. Based on recent overseas political events, it is engagement that is required not only to prevent corruption but also to prevent disruption. This highlights the potential good accountability systems provide, building strong government and a strong economy. There has been a flurry of activity over the last couple of months as the Government scrambles to release New Zealand’s second Open Government Partnership National Action Plan by the October deadline. In August, TINZ submitted recommendations for New Zealand’s second Open Government Partnership (OGP) National Action Plan (NAP). Among the recommendations were a call for more ambition in creating the next NAP and developing channels of communication for improving engagement with citizens. TINZ participated in a number of workshops conducted by engage2 and the State Services Commission. The workshops were productive and a solid source of ideas and recommendations. The current State Services Team is late to the effort. They recognised the need to make up lost time. All involved are determined to continue this process into the next National Action Plan. The ambition is for significantly increased citizen involvement and to promote substantial open government improvements in the spirit of the OGP grand challenge. The SSC is due to provide a draft National Action Plan for Cabinet’s approval in September. TINZ is keen to see the output of this process. The expectation is that the plan will be a solid roadmap for achievable objectives over the next few years. Have your say on how our country should tackle money laundering and countering terrorist financing as part of Phase 2 of the AML/CFT Regime. The Ministry of Justice is seeking your views to help determine some of the details of the extended AML/CFT regime, so that we can enhance New Zealand's efforts to detect and deter criminal activity while minimising the impact on businesses. Click here for more information. The deadline for submissions is 16th September. Thomson Reuters is hosting a complimentary webinar on How to manage bribery and corruption risk in your supply chains on 20th September (Tuesday) at 13:30 Hong Kong / 15:30 Sydney / 17:30 Auckland time. This is the first of four part Thomson Reuters webinar series focussing on transparency in global supply chains especially in relation to risks such as bribery and corruption, illegal mining and conflict minerals, modern slavery, and illegal logging. TINZ Chair, Suzanne Snively, will be speaking about how supply chain risk impacts in Asian countries and the opportunities that occur when this risk is managed through quality procurement and other corruption prevention measures. More information. Auckland Mayoral candidates will discuss immigration and diversity at a Massey University debate on Thursday, 22 September at mid-day. The debate will be chaired by broadcaster Susan Wood and follow an opening address by Distinguished Professor Paul Spoonley, an internationally recognised specialist on immigration and diversity issues. Candidates who will be present are Vic Crone, Phil Goff, David Hay, John Palino, Chloe Swarbrick and Mark Thomas. >In conjunction with the New Zealand Fabian Society. Wesley Church, 75 Taranaki Street, Wellington. Hear Distinguished Professor Paul Spoonley, of Massey University, discuss whether the current economic climate in New Zealand is hiding a population ‘bomb’; and how to moderate the very different growth rates of different parts of the country. The Fraud Film Festival is coming to New Zealand. Deloitte and a number of other key partners will be running Fraud Film Festival in November in Auckland. This cultural event is in its second year and has a unique goal of achieving better collaboration across the public and private sectors to raise financial crime awareness levels. The 2016 TINZ Annual Members Meeting will be on 10th November 2016. John Shewan is confirmed as the keynote speaker. You must be a member to attend. 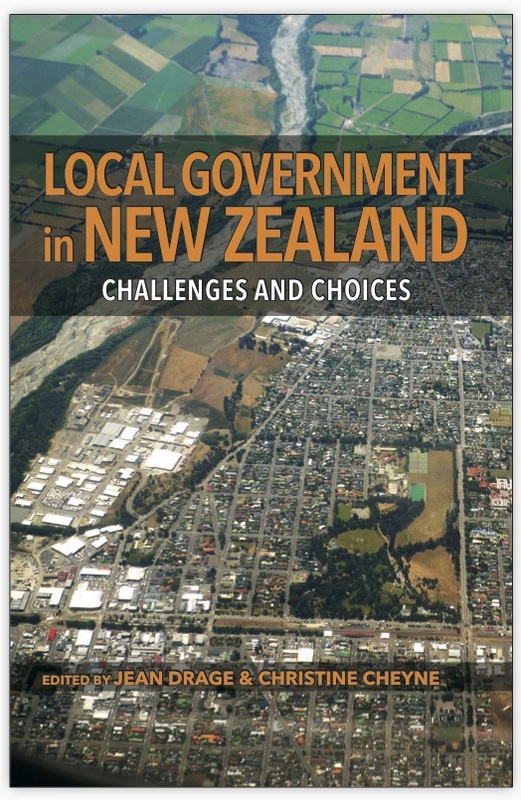 Local government in New Zealand faces major challenges. Among the most pressing are continual legislative change, threats to its autonomy, the gradual erosion of community voices in council planning and decision-making, and the need for funding solutions to ensure property rates remain affordable. There is an urgent need for a more coordinated approach across central government on major policy issues such as climate change and housing. This book is a 'one-stop information shop' on local government that can be used by those who regularly interact with or study this area of government, by those working within local authorities, and by those who actively work to ensure their communities grow in a sustainable way. Click here for more information.